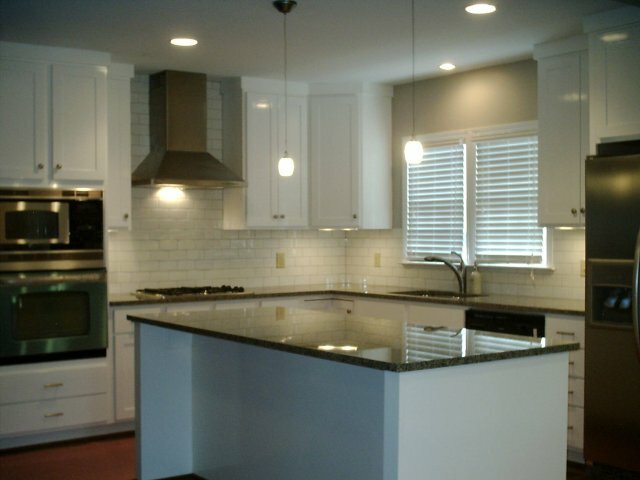 The Edgewood project was a fun kitchen, den, and laundry remodel on a 2/1 cottage in Homewood. Inspired from the Rockdell Lane design, we opened up four spaces to create an expansive (relatively) kitchen and living space by incorporating a large drop header constructed with a structural, laminate beam between the kitchen and the den. Our friends at Brewer Cabinets designed and manufactured the new kitchen and laundry cabinetry, and the tops were installed by Kip Simmons of Stone Works, LLC. We chose to purchase all of our appliances from Home Depot, taking advantage of the financing packages that are offered from time to time. Out "little project manager" is inspecting the progress of the new back porch that JM Construction was installing for us.